The Group Pattern Language Project is overwhelmingly a volunteer collaborative work effort. Thousands of hours in total have been generously invested by over fifty contributors. In the spirit of a gift economy, we offer the products of that work out into the commons. We seek donations to help further our mission to learn and share the core wisdom of what makes deliberative group work successful. Donations are used to help print more Group Works decks, make brochures to distribute at events, send decks to people who can help get the word out, hold face-to-face meetings, host the website, create materials for workshops, attend relevant conferences, and more. 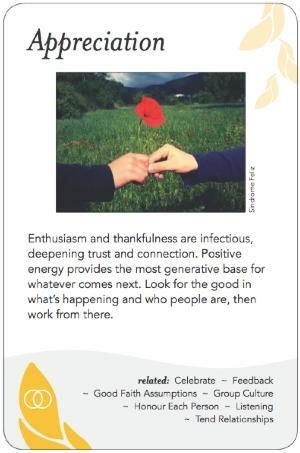 Our ability to nurture the vision, including launching additional future projects to help facilitators and other group process workers, depends on donations from those who use and appreciate the card deck (either the printed or free download version) and/or the mobile app version. We funded development of the deck ourselves in the belief that it would make a difference in the world. Project members have paid for travel, food, meeting supplies, printings of early drafts, and all the other things needed to make this real. The costs of designing and printing the decks are funded by zero-interest loans from members of the Core Team, to be repaid from revenues of card deck sales. Any profits from the deck above costs go back into the activities of the non-profit. The Group Pattern Language Project is a 501(c)(3) tax exempt public charity effective November 4, 2011, and is registered in Oregon USA as a non-profit corporation. Your tax-deductible donations can be made by PayPal or major credit card using the DONATE button below. Or, you can send cheques payable to Group Pattern Language Project to 2662 Alder Street, Eugene, Oregon 97405 USA. Thank you for your support in making the Group Pattern Language Project a continuing success!